Would you wander around London in the dark of night? Statue inspired by the 1927 silent film London After Midnight. The Man in the Beaver Hats stands about 12 1/2-inches tall. Screen legend Lon Chaney, Sr. in one of his most famous roles! If you're willing to wander around London in the middle of night, you might chance to meet this fine fellow. 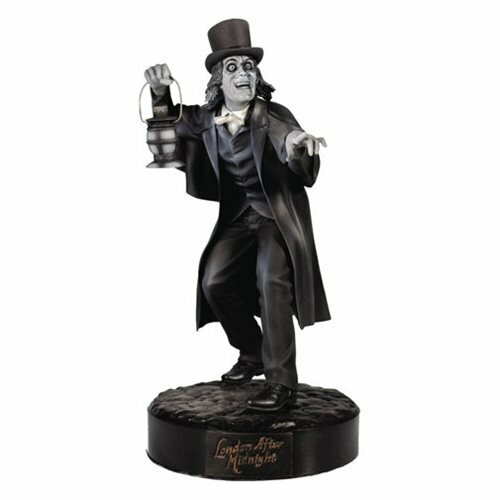 Inspired by the 1927 silent film London After Midnight (aka The Hypnotist), one of the most famous and sought after of all lost films, this creepy statue presents screen legend Lon Chaney, Sr. in one of his most famous roles. "The Man in the Beaver Hats" is sculpted in polystone by Jeff Yagher and stands about 12 1/2-inches tall. Have you got the courage to order this London After Midnight Resin 1:6 Scale Statue? Ages 13 and up.